Final Round: Battle of the Close-up Photography Tips! It's been a fun week here on my blog - and on Juan Pons' blog. We have both enjoyed the Battle of the Close-up Photography Tips. Today is the final round. Thank you all for joining the close-up photo fun. My tip for today: Think. Think carefully about the aperture you choose. For the praying mantis photograph on the top right, I shot at f/5.6 (for very shallow depth of field) to draw attention to the mantis' head. For the photograph on the top left, I stopped down to f/16 for greater depth of field. Think about the story you want to tell. I like the photo above that shows the full body of the newborn butterfly. 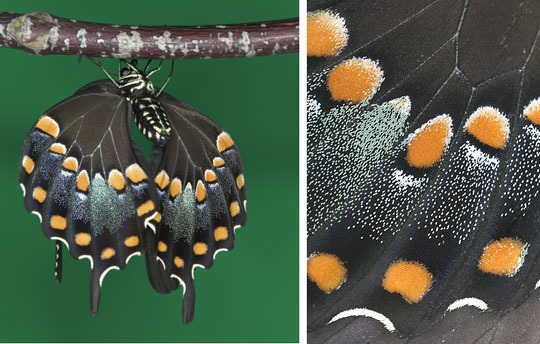 The photo on the right, however, tells a different story, a story about the multicolor scales that cover the butterfly's delicate wings. Think about the wonders of nature. 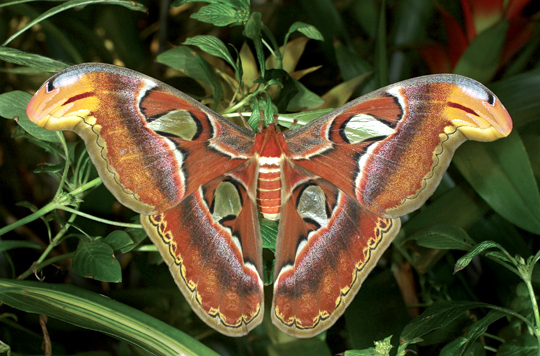 Do you see the two other "animals" in my photograph of an atlas moth. Nature is amazing! Post you comment here if you see 'em. For Juan's tip, go to his cool site. If you like this post, please share it with a friend. All you have to do is click the twitter icon below. And don't forget, you can follow me on twitter for almost daily tips. For more info on close-up photography, and photography in general, check out my apps. Click here to start the photo fun! Juan and I co-developed Butterfly Wonders (which features a section on close-up photography) and Life Lesson We Can Learn From Mother Nature.